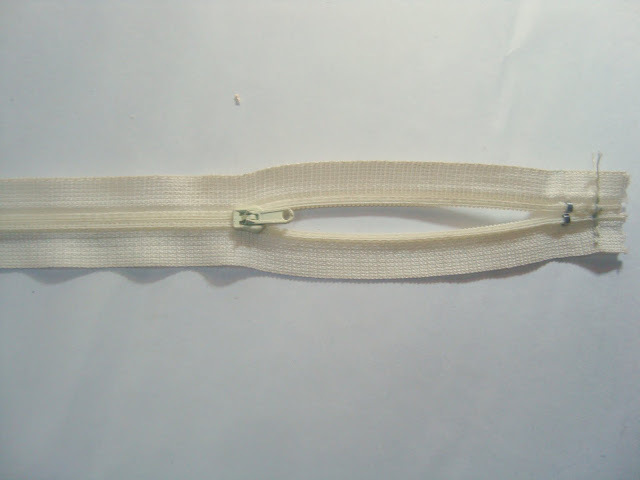 One thing that I have come across very often is how lot of crafters are REEEALLY scared of zippers! Believe me its much easier than it looks!! 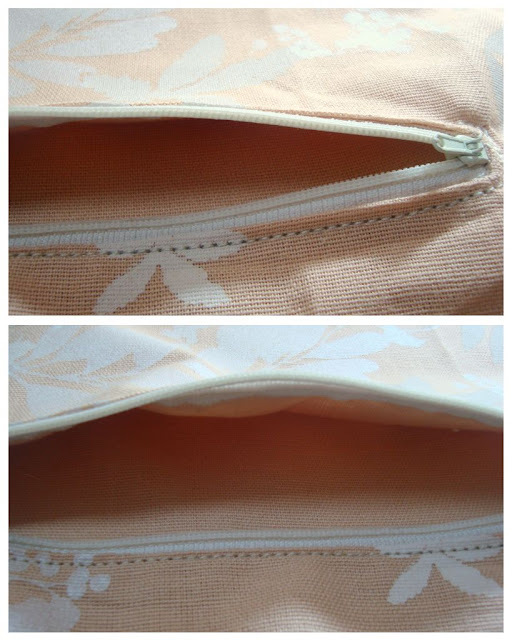 Today I am going to do a quick tutorial on adding zippered pockets to your bags & purses. 1. 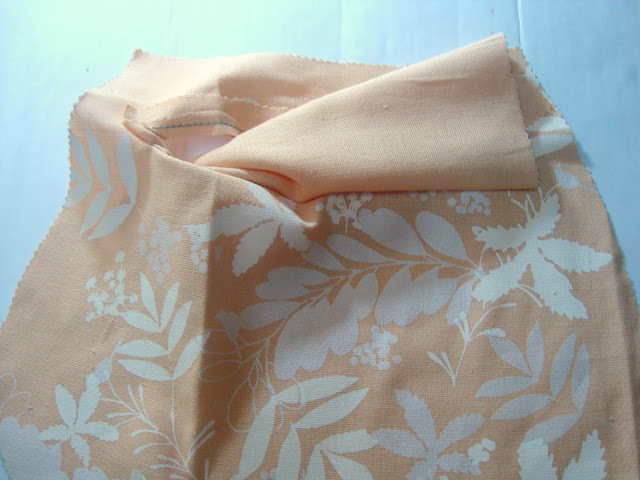 Firstly cut your lining piece................I know its probably dumb of me telling it but we will be adding the pocket before we assemble the inner lining.Take one of the lining pieces.If you are using printed fabric like me,take a piece with nice print as it will show up . 2. 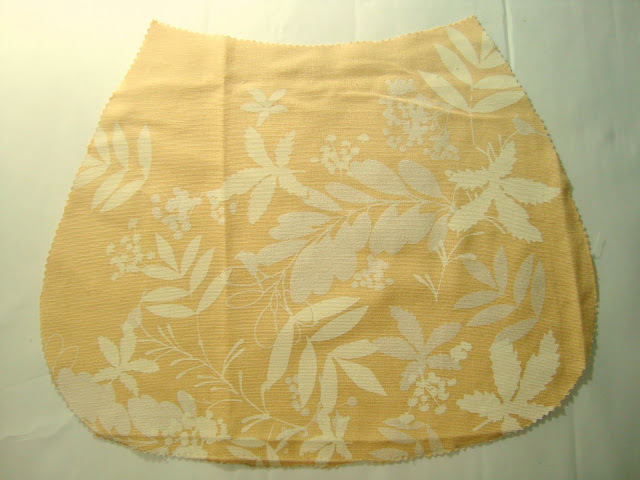 Now you have to cut 2 pieces for the pockets.It is wise to cut on paper first.Keep the pieces on the lining & see what is the appropriate size.It should be ideally 1.5" away from both the edges as you will be sewing the lining pieces together later.The pocket should be placed at least 1.5" from the top too.Also keep in mind that you will be gusseting the purse so the pockets should not reach till the bottom of the lining . After considering all these,cut 2 pieces from whatever fabric you want to make the pockets from.You will either have a square or a rectangle depending on the shape of your purse. 3. 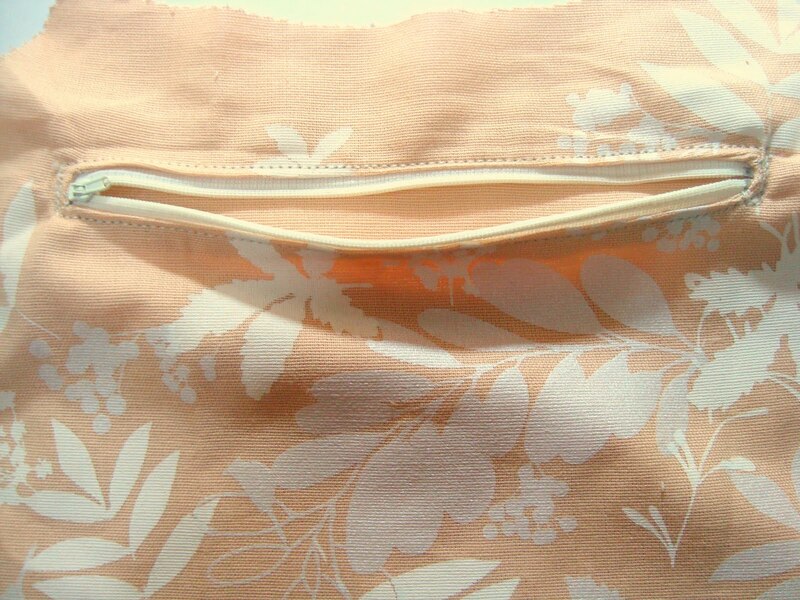 Now keep the lining piece right side facing upwards & place one of the pocket pieces on it wrong side facing up .Now mark with a pen where you would want the zipper to be.It should be at least 1/2" from both the edges as well as from the top.Craw a rectangle like in the pic below.The rectangle should be 1 cm wide,enough to create a nice boxy opening for the zipper. 4. Mark the corner triangles too.They are responsible for giving a nice shape.Now sew along the rectangle only.Not the triangles or the middle line,just the outline.Sew both the layers together. My fabric is pretty thick so I didn't add any interfacing,you can if you feel your fabric is thin.In case you do not like a stiff pocket then just add a rectangle of interface to the area where the zipper will be added,so it adds strength to your zipper. 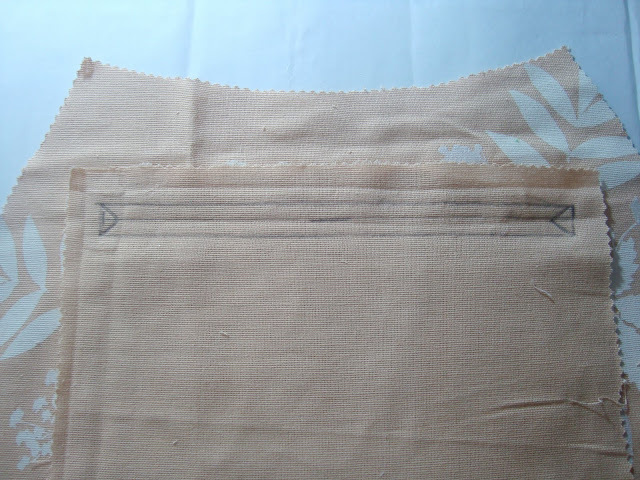 Now take a sharp scissor & cut the center line as well as the triangles.Make sure you don't rip the sewing on the outside border.Cut through all the layers. 5. 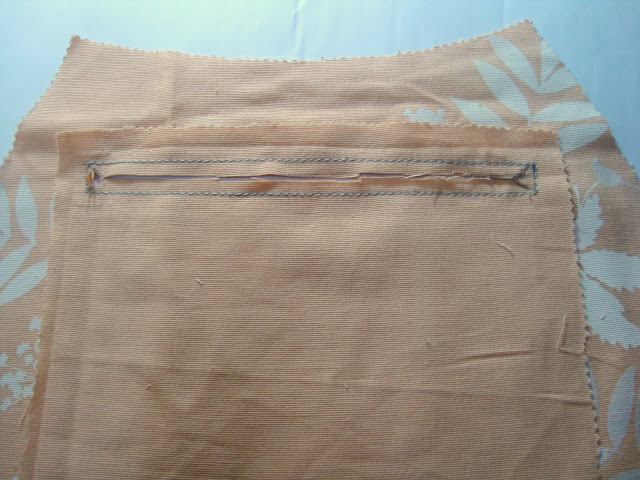 Now push the entire pocket piece out of the window you just cut.Make sure every single piece goes on to the other side,use your iron here. 7. 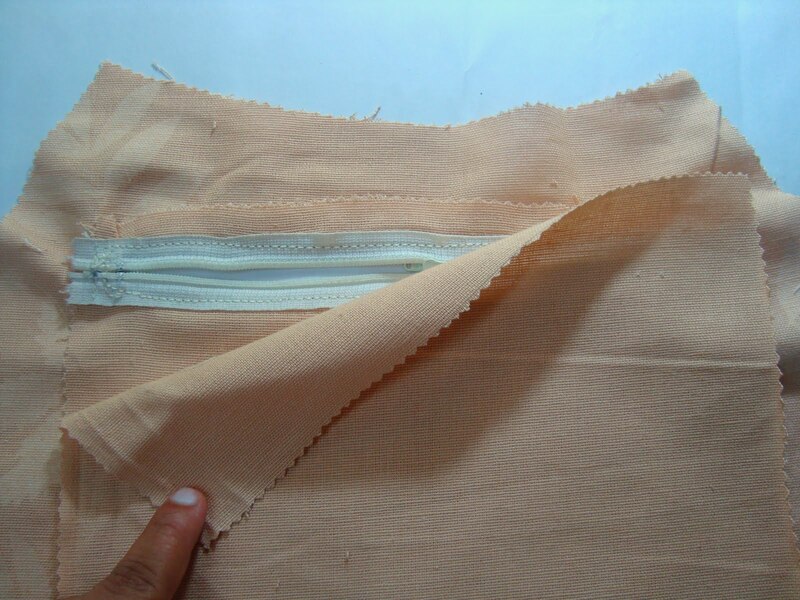 Now take your zipper,it should be at least 1 inch longer than this window you have created .It's OK if it is longer ,you can always cut it off.Sew the open end shut like this. 8. Place the zip at the back ,adjust the placement,pin it as required & sew all four edges.Cut off the excess zipper at the back.Backstitch at the two ends of the zipper.This is how it will look from the front & back. 9. 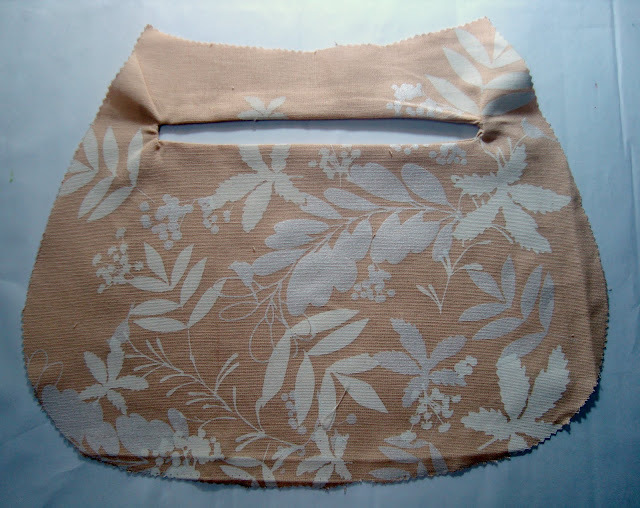 Now you have to just add the back piece to the pocket.Simply keep it on the pocket at the back & sew all four sides.Remember to keep the lining out of the way. 10. And you are done!!!!! Drop me a line if I have confused you anywhere. Thank you for posting this!! 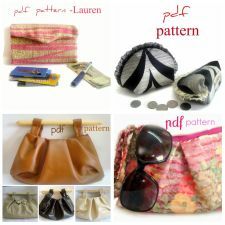 I've been scouring the internet for the last half hour and your tutorial is the best I've seen. Thank you so much for this tutorial! 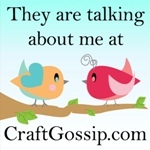 Clear, easy to understand, and your pics were perfect! Thank you for the tutorail. I'm about to try it now. With luck it will turn out just perfect. This helped me really fine tune how I thought this was done. I was commit to turning the cutest pillow from Pier 1 into a purse and I completed it. Thanks for the help.